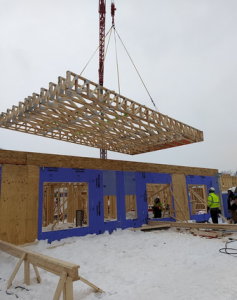 Despite the cold and snowy winter we are having in Minneapolis, Alliance’s newest building, Minnehaha Commons, is getting built. The site comes with a sad history. In addition to a bar on the street level, the building had six apartments upstairs which housed 12 adults and seven children. On the morning of April 2, 2010, six people lost their lives in a fire. Ryan Richner, who worked at the bar, lived upstairs, and was giving shelter to his friend, Andrew Gervais, Gervais’ three young children, and Gervais’ mother. The family was planning on only staying one night. Because of this tragedy, the city’s worst fire since 1986, the Minneapolis City Council voted to overhaul its housing inspection program. Consequently, it is with a real sense of commitment to safety and stability that Alliance Housing is building Minnehaha Commons. It will be good to rededicate the site, to provide safe, stable, accessible and affordable housing for very low-income people over age 55. Excavation has been completed, and if you drive by 3001 East Lake Street you will see the foundation is laid, walls are going up, and it is beginning to look like a building. Soon the focus will be on the interior of the building, putting in a security system, and finalizing the interior design. The building will be home to 44 single adults with a history of homelessness. Fortunately, there were no big surprises found during excavation, just an old water service pipe, and an old foundation wall, both of which were easily dealt with. Unfortunately, the frost depth in the Twin Cities is at 40 inches this winter, which has made it more difficult to accomplish some work below ground. Additionally, more delays have been caused by the weather, such as the time the contractor was scheduled to put up the big crane on site. The temperature was so low that day, the hydraulics in the crane would not work. And unfortunately, the heating bills and snow removal bills are higher than anticipated, but that’s true for all of Minneapolis this year. Everyone, including the general contractor, has been working overtime to keep the alley and sidewalks clear of snow, work around problems, and move forward. Despite these issues, construction is on schedule. The contractor has been working diligently, staying on track for construction completion in October 2019. Soon an application process will be set up, with people to move to their new homes by December 2019. Alliance Housing is looking forward to opening the doors to our new residents and filling a need and an empty space in the Longfellow neighborhood. Jorge has lived at Alliance Housing’s rooming house on Pillsbury for almost 3 years, since 2016. He is quiet and soft-spoken and enjoys reading spy thrillers and westerns in his free time. He has a positive and forgiving attitude, and is a valued Alliance resident. He respects his fellow residents, follows the rules, and pays his rent. Jorge got out of prison in 2015. He spent a year in the Intensive Supervised Release program. His supervisor saw that Jorge was doggedly following the rules and recommended that he be put on regular parole. Now, instead of having to check in with his parole officer multiple times a week, Jorge sees his case worker once a month. Jorge is on the straight and narrow now that he has paid his debt to society. He says, “I can’t go back in.” He is also adamant about not returning to the life of drugs and alcohol. When he was initially on parole, Project for Pride in Living sent him to St. Stephen’s where he met property manager Bob Bono, who encouraged him to apply to Alliance Housing. Bob saw Jorge as a good risk. Alliance Housing has a long history of screening people in to our housing. We want to give people a second chance, and therefore do not screen out prospective tenants due to past criminal history or bad credit. We have found that tenants that others reject are just as reliable as those without problems in their backgrounds. Jorge had to wait about 9 months for an opening, and Bob called him numerous times to get a hold of him. He really kept after Jorge to ensure that he got in. When asked what his Alliance home means to him, he said, “It means life. I make sure I have a roof over my head. My priority is paying my rent and buying food. I have cable, but that can go away.” He is taking care of the “little big things” so that he can keep his home at the Pillsbury rooming house. Jorge is originally from Cuba. He moved to Miami where he lived with an uncle and had a job as a cook. Although he cannot go back to Cuba, he keeps in contact with family there. He was visiting friends in Minneapolis when he met a girl and decided to move here. 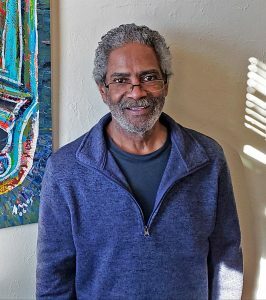 He has lived in Minnesota since 1981, residing in both St. Paul and Minneapolis. Currently, Jorge works in the kitchen of a restaurant at the University of Minnesota. He really enjoys the job, which requires him to be active, moving, and always on his feet. He credits his active job, eating better, and losing weight to improving his health. His diabetes is under control, and he is down to taking only one pill a day to manage his health. Jorge sees that Alliance has given him a chance, a second chance to have a better life. He is resolved to make the best of it. He is happy in his Alliance home. Alliance Housing volunteer and donor, Tina Johnson, understands the devastation that happens when people lose their home. At her day job, Tina works for a company that does fabric restoration. She serves people who suffered a flood or fire in their home and need their belongings to be cleaned and restored. It’s a demanding job, but Tina is high-energy. She is also interested in helping others through volunteering. Tina often travels for work, so she felt it would be hard to establish a routine as a volunteer. She was pleased to find that she could help Alliance Housing residents by assembling hygiene kits (soap, shampoo, and more) from home and on her own schedule. Tina loves to hunt for bargains and collects travel samples, too. 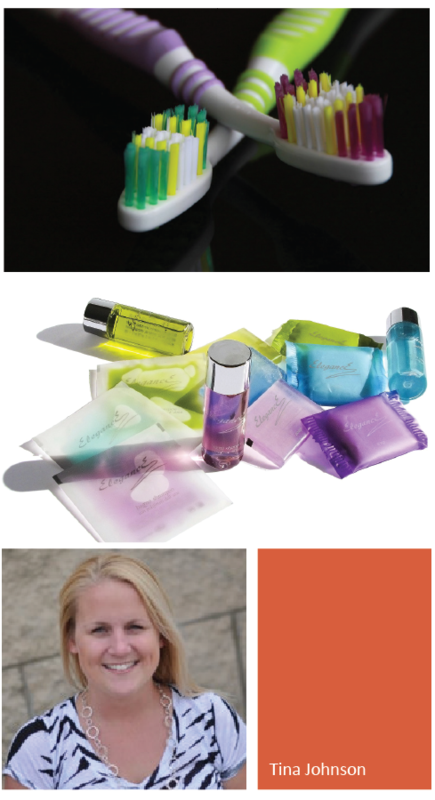 In two years she has made over 50 hygiene kits for Alliance Housing residents. Tina also has helped clean up the Alliance database so that it is as accurate as possible. The first time she came to Alliance to drop off the hygiene kits, she overhead a client say he needed underwear. At that moment, Tina knew she was giving her time and materials to the right organization. She now drops off her hygiene kits every few months. Tina is also an enthusiastic aunt and godmother to two nieces, ages 6 and 4. She gave some thought to the question “How can I be a good godmother?” She decided to engage her nieces in making cold weather kits for homeless people, which included socks, handwarmers, gum, and peanuts. The trio set up an assembly line at Thanksgiving and had a lot of fun working together to help others. When Tina was in college, she had the opportunity to study in London, England, and ended up working at Apex Trust, an organization that promotes employment as a route out of reoffending for people with a criminal record. This experience, and her work at Alliance, has made her think about how the criminal justice system needs to change, and that people need a second chance after paying their debt to society through incarceration. She loves that Alliance Housing, Inc. is all about second chances, and helping people to be more successful by keeping a roof over their heads. Tina is a person that sees a need and steps up to help. Her work for Alliance Housing is meaningful to our residents, and to Tina. Thank you, Tina!